What is the difference between old time and bluegrass fiddle? I’ll give you more details below, but in my opinion, the difference really comes down to two things: influence and delivery. Regardless of the differences, both forms have large following today. Old-time purists are intent on preserving the historical style, while bluegrass is celebrated for its continued evolution. Fiddle playing has a rich tradition in America that can be traced back the earliest settlers. As immigrants arrived, they brought with them songs and traditions from their home countries. Old time fiddle, or “traditional fiddle” became a unique style that’s a blend of varied origins. It originated in the Appalachian region, then spread to other areas of the country. Many of the tunes were based on stories passed on through oral tradition. Some were a portrait of daily life and ranged from humorous, to joyful, to sorrowful and melancholy. Some tunes are so old the authorship has been forgotten. It is played with little accompaniment, other than perhaps a banjo, and is primarily meant for dancing. Waltzes, reels and hornpipes are common dances in the genre. Use of double stops. The music is very rhythmic and most notably utilizes playing on two strings at once, one string providing the melody, the other providing an accompanimental drone. Various tunings are used and the bridge of the instrument is often filed down in order to make playing these “drones” or “double stops” easier. Instrumental songs. Although lyrics exist to many of the songs, they are most often played as instrumentals. When lyrics are sung, vocal talent is not a prerequisite. Some well-known old time fiddlers include “Fiddlin” Charlie Bowman from Tennessee, “Uncle Norm Edmonds”, from Virginia, and Ahaz Augustus Grey from Georgia. To list only almost seems dismissive, because there are SO MANY local legends who had a profound impact on their little corner of the world. Some fiddlers are remembered more because their students carry on their name and their traditions, or they were recorded or studied by folklorists and musicologists, or they won major contests. Brad Leftwich is a prolific student of Tommy Jarrell and has very much contributed to keeping Tommy Jarrell’s memory alive. Jehile Kirkhuff became a world fiddle champion in the 1960’s and since has enjoyed the attention of many musicologists. He also left behind many recordings which were circulated widely. Henry Reed was very well documented by the folklorist Alan Jabbour. Some of the most well-known songs include, Arkansas Traveler, Billy in the Lowground, Cluck Old Hen, and Cripple Creek, but again, there are thousands. Old Time fiddlers associations across the country keep the task of preserving this form of music, and fiddle contests are held all over the country throughout the year. Bluegrass music arose from the same roots as old time, but incorporate broader influences, including country, gospel, folk, jazz and blues. It became popular with the emergence of the radio, and artists created songs for the express purpose of being radio-friendly (rather than intended for live performance and dances). Three of the most famous contributors to the bluegrass scene are Bill Monroe, Lester Flatt, and Earl Scruggs. Their wide popularity made bluegrass a genre all of its own as people began to emulate their style of playing. Fiddlers Chubby Wise and Kenny Baker (who we recently lost in 2011) both played for many years with Bill Monroe and were therefore very instrumental in defining Bluegrass fiddle as a style. Bluegrass differs from the old time style in various ways. Whereas old time fiddle was primarily fiddle alone or with banjo, bluegrass incorporates other instruments, such as the mandolin, guitar, and upright bass. The tunings became standardized on GDAE to allow more instruments to play along. Most of the songs use vocal harmonies extensively. In performance, players take turns to showcase their talent, rather than playing all at once. Bluegrass music is highly improvisational and virtuosic, similar to jazz, with the melody being played once or twice followed by a virtuosic solo that has almost no hint of the melody. Most bluegrass songs include solid background accompaniment. Many of the traditional tunes are played by bluegrass musicians, but in much faster tempos. These style differences make them unique to the genre. Some of the famous songs include, Wildwood Flower, Orange Blossom Special, and I’ll Fly Away. 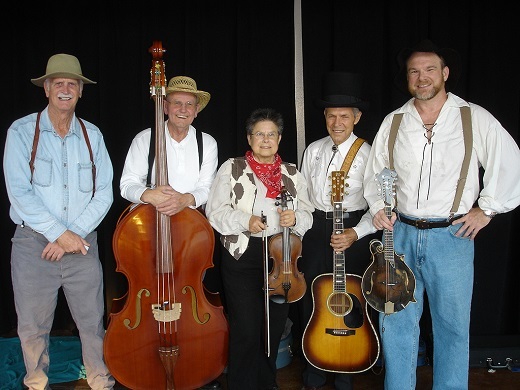 **Umpqua Valley Bluegrass Band. Photo by Joe Ross. Creative Commons License.